Hedgehog Corner Camping Touring & Camping ParkRelaxed peaceful and quiet rural camping in pretty field close to River Cottage HQ (1.6 miles) Jurassic Coast seaside at Lyme Regis (2.4 miles). Walking distance of local pub, bus stop & shop. Live on line booking on home web site. Free fast Wi Fi across site. Tents only for adults and couples. 10 pitches only. Max 2 per tent. 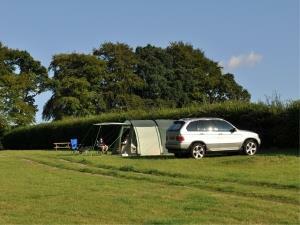 Each pitch has use of a solid wooden picnic bench and cars may park next to their tent or in the tarred car park. Campers have use of fridge freezers, washing up points and shower facilities all included in tariff. Contact & booking via web site. Regret no groups, no pets and no children under 18. This is a quiet peaceful tent only camp site. Bookings online only please, no walk ins. Live on line booking and full information on our home web site. Camping field with cut away areas for tents. 10 tents max. Free fridge freezers and free wi fi. Relaxed peaceful and quiet rural camping in pretty field close to River Cottage HQ (1.6 miles) Jurassic Coast seaside at Lyme Regis (2.4 miles). Camping for Tents only. Bookings taken on line only via our home web site. Adults only, couples only. Regret no groups, no pets no walk ins. Free fast Wi Fi across site.